Those of you who’ve cooked from The CSA Cookbook know that I love to use the odds and ends of vegetables in my recipes — in part because I try to waste as little as possible in the kitchen, and because these “scraps” are vegetables in their own right, full of flavor and texture. Chard stems are one such scrap that’s sometimes discarded or composted when recipes only call for the tender leaves. The stems, however, have a mild flavor that plays well with other ingredients and a pleasant crispness similar to celery ribs. If you find yourself with a good handful of stems, don’t toss them — pickle them! The sriracha pickling brine in this recipe is spicy and tangy, but not so much that you can’t taste the food. 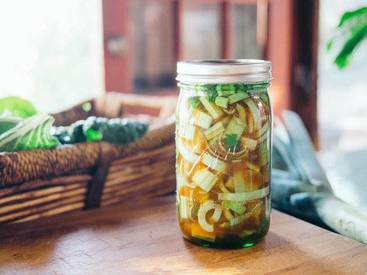 It can also be reused for another round or two of chard stem pickles after you eat through the first batch. Best of all, they’re refrigerator pickles, meaning no boiling water bath is necessary, and beginner canners need not be intimidated. Just grab a jar and go!